Our office is equipped with the latest technology in diagnostic and examination equipment. This allows us to provide our patients with the most thorough, comprehensive eye examinations available. The eye is unique in that there are many diseases which have ocular manifestations. We thoroughly check the internal and external health of your eyes including tests for cataracts, diabetes, macular degeneration, glaucoma and many others. We also check for the presence of corneal disorders and examine the retina to ensure proper health and good vision. 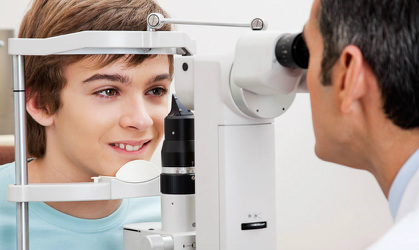 Your complete eye examination may include a prescription for glasses if needed, which may be specific for distance vision, reading or computer use. We allow a complete hour for your eye examination and contact lens evaluation. Your eyes will be dilated which means your near vision may be fuzzy for about 3-4 hours. Your eyes will also be sensitive to light. It's a good idea to bring your sunglasses with you. Also we ask that you please bring any contact lens information or any prescription glasses, such as computer or reading glasses, with you to your examination. We look forward to meeting you.